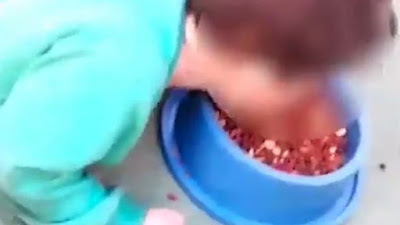 This is the sickening moment a mum LAUGHS as she forces her two-year-old son with learning difficulties to eat dog food from their pet's bowl . The disturbing scenes were reportedly recorded by the mum in the city of Trindade in the Brazilian state of Goias. The tot's grandmother says the dog food made him ill after he was seen with his head rammed into the dog bowl full of food. The two-year-old's mother can be heard saying: "Hey little one, you are going to have lunch, right?" The youngster carries on eating out of the bowl as a dog comes into shot and joins him, while the woman recording can be heard laughing. Local media report the boy has learning difficulties . The video was reportedly posted into a family group chat and then posted online by the child's paternal grandmother. The grandmother who posted the video online said she received the video in a message along with the words: "Come and make me lunch grandma! I am trying to improvise with a little snack." Police are now investigating the mother of the child and the boy's great-aunt who was reportedly present when the video was recorded. Investigator Vicente Gravina said the pair may face criminal charges. He said: "The grandmother received this video and was angered. Immediately the grandmother went to her daughter-in-law's house and fetched the child, who began to feel sick. So she came here today and denounced the case." The mother's lawyer has spoken in defence of her actions. The lawyer, Marcia Gabrielle Sampaio Carvalho, told reporters that the boy's parents deny having "pejorative or malicious" intentions and said the boy "is well-loved and cared for by all those around him." She added: "The suffering occurred because of the cruelty and irresponsibility of the boy's paternal grandmother who, having access to the video in a family group, distorted the facts and posted the images to social media in a negative way, causing diverse interpretations which are out of the real context." 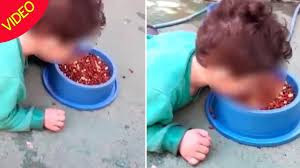 Police confirmed they do not know why the mother and great-aunt recorded the child eating the dog food but said that the pair thought it was funny.